The Vienna Institute of Advances Studies has most definitely already seen better days. After a successful period under former head Bernhard Felderer, the institute, or at least its Economic research division fears closure during the spell of current interim director Sigurd Hoellinger. The institute was founded in 1963 by world-leading Austrian researchers Oskar Morgenstern and Paul Lazarsfeld with financial assistance of the Marshal plan. Initially, it set out to revive Austrian Social and Economic Sciences which lacked competitiveness internationally after WW2. Ever since its foundation the institute has been organizing a two year graduate program in Economics (nowadays graduates are awarded a Master’s degree upon completion). Astonishingly, the current interim board – with apparent support by local politicians – plans to disestablish the current department structure (Economics, Political Science, Sociology) in order to regroup researchers into interdisciplinary areas. This appears to initiate the end of an era of successful research in Economics at the institute as there is hardly any successful example of such an act of restructuring in fundamental research in Economics. It seems natural to assume that a downgrade of Economic research and the cessation of graduate education will significantly diminish if not destroy any appeal of the institute to leading researchers. The current events reinforce the suspicion that restructuring is the politically smoother idiom for downgrade. The motivation for those measures appears to remain a mystery. An argument recurrent in the Austrian media landscape is insufficient funding, which seems ridiculous. Whereas it is per se questionable to require fundamental research to fund itself the Austrian Institute of Advanced Studies is in general externally funded to a larger degree than comparable institutions in the German speaking world. What is more, funding an Economic research group is preposterously inexpensive when compared to other research disciplines. This fact is mainly caused by comparatively low-cost equipment necessary for Economic research: A notepad, a pencil, nowadays a laptop and eventually data; with cost for the latter being rather negligible due to a rather theoretic and small research group at the IHS. Finally, wages at the institute are at most average when compared to international competitors. 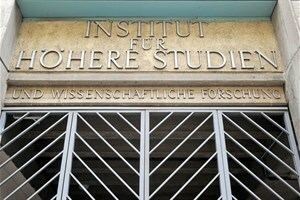 In recent weeks at least scarce mentioning of the institute was observable in the Austrian media. First and foremost I would like to refer to Hanna Kordik’s article in the Austrian newspaper “Die Presse” and to former IHS researcher Alex Stomper’s commentary in the Austrian newspaper “Der Standard”. Alex Stomper, as of today professor of Finance at the Humboldt University in Berlin, Germany, mentions the IHS’ master’s class of 2011 as an example of recent success when graduates went on to pursue doctoral education at Yale, Northwestern or the London School of Economics. Mentionable instances of former successful graduates are Ernst Fehr – a recurring favorite for the Noble prize in Economics – or Wolfgang Pesendorfer, at the time of his inauguration among the youngest professors of Economics at Princeton. Another napless argument against the maintenance of an Economics research group at the institute is its substitutability in terms of education by Austrian universities. Personal experience and those of many friends and colleagues shows that demand for Economics graduates of Austrian public universities at potential top class employers is scarce. Public Austrian universities are – primarily due to chronic underfunding – incapable of regularly meeting high international standards in terms of supervision and mentoring both in terms of quality and quantity. On occasions, contributions in the national media have questioned why an Austrian institution is indirectly funding American top universities with human capital. This perspective is unfortunately out of context. Austria does not subsidize such research institutions. It is rather the case that IHS graduates are rewarded with world-class education for their efforts as research or teaching assistants at those organizations. It goes without saying that a degree from an international top 10 university opens doors of both academia and private enterprises alike worldwide. Relative to its size and population Austria looks back at an impressive and proud history of scientific achievements. However, the large part of those took place more than half a century ago since back then the dark era of WW2 destroyed our excellent conditions for fundamental research, which depends to such a large extent on inter-generational supervision and transmission of ideas. While rehabilitation in academia traditionally could not keep up with developments of the Austrian economy, the IHS has served Austria well for a long time producing internationally competitive research output and human capital. Conversing with non-German speaking internationally renowned economists the Vienna Institute appears to be among the most frequent topics after the Habsburg dynasty and the Vienna opera house. It might be suspected that the de facto closure of the Economic research division is linked to some dubious political quid pro quo pact. This raises the question whether Austrian politics understand it to be inappropriate nowadays to harbor a claim for excellence in our country. I am a fiery advocate for free access to education in Austria – as a measure to set economic impulses, increase the average quality of life and prevent a multi-level society – not necessarily in this succession. However, it appears to me that equality of opportunity ex ante is generally confused with the same ex post. Even in a country rightfully proud of its solidary statutes, merit may be rewarded and – quite more importantly – should be met with promotion. Thomas Jungbauer is PhD candidate at the Kellogg School of Management at Northwestern University in Evanston, a northern suburb of Chicago, Illinois. Before his education at the Austrian Institute of Advanced Studies (IHS) (Class of 2011) he studied at the Vienna University of Economics and Business (WU) and the Vienna University of Technology (TU).